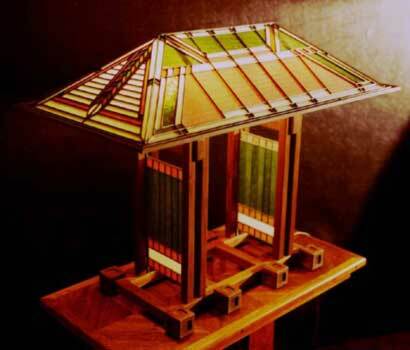 This is a lamp design based on an original design by Frank Lloyd Wright created for the Dana house in 1903. 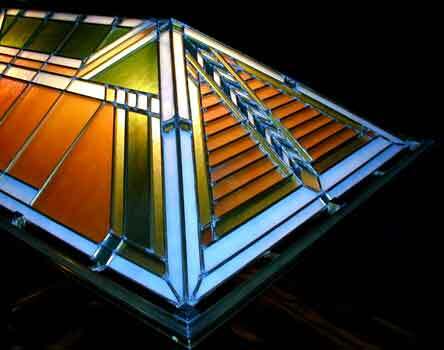 Later it was used in the Robie house with some modifications. Patterns for each are included in this design package. The Robie lamp was auctioned off at Christie's in New York on June 11, 1988 where it sold for $704,000. Replicas of this lamp sell for $12,500 at the Museum of Modern Art Bookstore in New York. The plans were derived from the 1909 Robie design and the 1903 Dana design. Changes were made to facilitate construction by crafts people with tools found in small shops. There are two major differences between the original lamp and these patterns; lamp harps are used to support the shade instead of four posts and the base is made of wood rather than metal. 8 sheets of plans, 22" by 34"